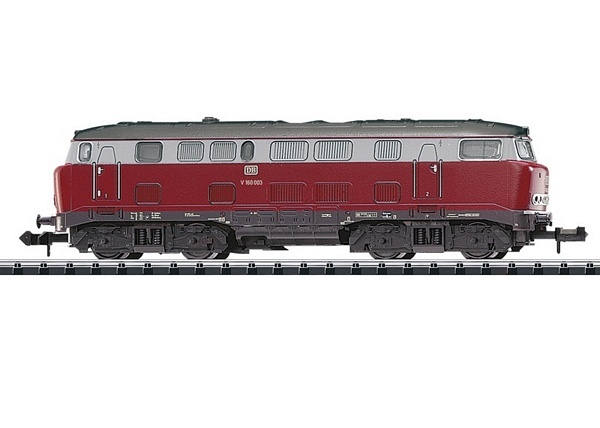 Prototype: German Federal Railroad (DB) diesel locomotive, road number V160 005, preproduction series. Nicknamed "Lollo". B-B wheel arrangement, built starting in 1964. Use: Passenger and freight trains. Model: The locomotive has a digital interface connector and a 5-pole motor. 4 axles powered. Traction tires. The headlights will work in analog operation and can be controlled digitally. Length over the buffers 100 mm / 3-15/16". In 1956, the German Federal Railroad's central office in Munich reached agreement with the locomotive builder Krupp in Essen on the development of a single-motor general-purpose diesel locomotive. The original plan was for a unit with a nominal performance of 1,600 horsepower and a class designation of V 160 corresponding to the usage at that time. It was to have two cabs, two two-axle trucks, a maximum speed of 120 km/h / 75 mph, a maximum length over the buffers of around 16,000 mm / 52 feet 6 inches as well as sufficient train heating for an express train of ten cars. In 1960/61, the firm of Krupp delivered six prototypes as road numbers V 160 001-006. They were equipped with different 1,900 horsepower motors and gear drives. In 1962/63, four more units (V 160 007-010) from Henschel followed. The first nine locomotives had a fully rounded hood underneath the end windows that quickly gave them the nickname "Lollo" (from the Italian movie actress Gina Lollobrigida). The tenth locomotive by contrast showed the squared modern look from road number V 320 001. This became the typical identifier of the entire V 160 family. The pre-production locomotives designated as 216 001-010 starting in 1968 were retired between 1978 and 1984. Road numbers V 160 003 (DB Museum), V 160 001, 004, and 006 (Italy) as well as road number V 160 002 since brought back to Germany again remain preserved. After an extensive overhaul by September 2015, it is now the only operational "Lollo" in Germany. The rest of the pre-production locomotives were scrapped.